Some are fascinating, others are frightening -- but here's how to find out what Google has on you. I'm not just saying that, either: I recently started poking around in Google's personal data repositories and realized that, between my wide-reaching use of the company's services and my own brain's inability to remember anything for more than seven seconds, Google may actually have the upper hand when it comes to knowledge about my life. From face-tagged photos of my past adventures (what year did I go to Nashville, again -- and who went with me to that Eddie Vedder show?) to the minute-by-minute play-by-play of my not-so-adventuresome days (wait, you mean I really only left the house once last Wednesday -- and just to get a freakin' sandwich?! ), Google's got all sorts of goods on me. Heck, even my hopes and dreams (which may or may not involve sandwiches) are probably catalogued somewhere in its systems. And the data itself is only half the story: Google also compiles oodles of stats -- stats that, for better and for worse, shed light onto the tech-connected habits of our modern lives. How many emails have you actually sent over the years, for instance, and how many thousands of web pages have you pulled up in your browser? It really is enlightening, among other things, to see your actions broken down so precisely. Before you freak out, though, remember: The only way anyone else could get at any of this info would be if they were to gain access to your Google account -- something two-factor authentication and good mobile security hygiene make highly unlikely. And remember, too, that all this data collection is completely optional -- and very much a tradeoff: By agreeing to let Google store and use your data, you're getting access to an ever-expanding array of futuristic features at no monetary cost. But the decision is ultimately in your hands. To learn more about how Google uses specific types of data and how you can opt out of any or all areas of collection, see the "Opting out and taking control" section at the end of this story. All of that being said, here are some of the more amusing -- and maybe slightly surprising -- things you might find about yourself by prodding the right parts of Google's noggin. How many of these items actually apply to you depends on which Google services you use and how exactly you use them. To wit: Android users who take advantage of built-in features such as voice commands, location history and photo backups will almost certainly have more data tracked by Google than non-Android users. But anyone who regularly uses Gmail, Google search, Google Maps, YouTube, Chrome and/or other Google services from any mobile device or computer will likely find at least some interesting nuggets from the following list. Everything you've ever said to Google, in one convenient place. OK, Google: Remind me how silly I sound when talking to my phone (you know, when it seems like no one else is listening). 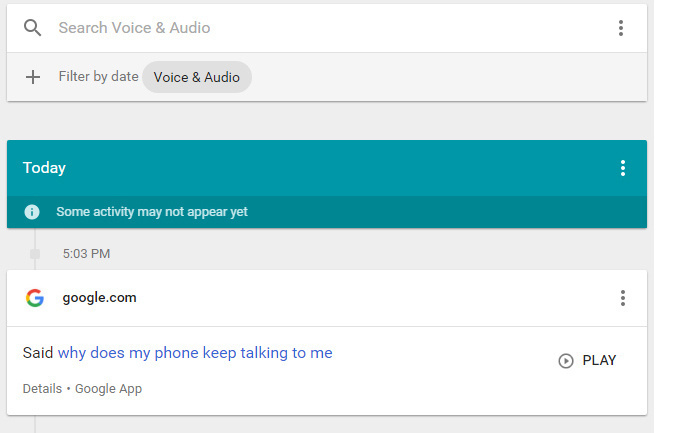 If you use voice commands on Android or any other Google product (for instance, voice searches in the Google iOS app when you're logged in with your Google account), head to the "Voice & Audio" section of Google's My Activity site to see and hear a comprehensive list of everything you've ever said to that inanimate object in your pocket. And yes, your voice really does sound like that. Data doesn't lie. Discover whom among your Google contacts you interact with the most by clicking the "Contacts" header on Google's account dashboard. Just be prepared to make up excuses if your significant other doesn't make the "Frequently contacted" list. Your browsing habits, broken down into indisputable numbers. 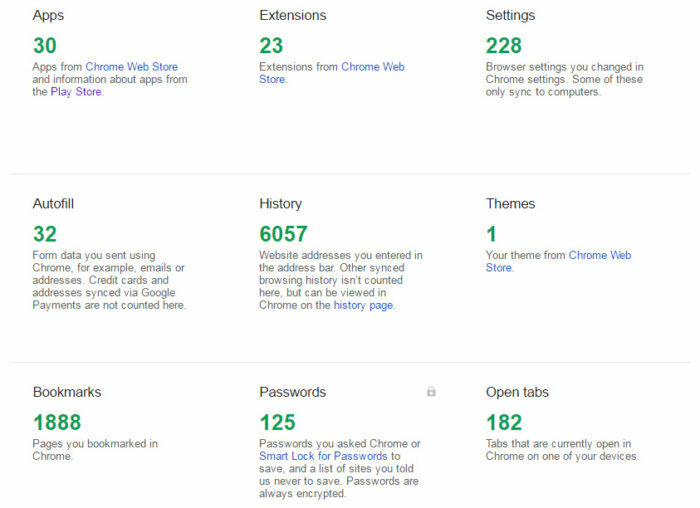 If you use the Chrome browser and typically stay signed into it, check out your account's Chrome Sync settings page to see all sorts of brag- and/or shame-worthy stats about your personal browsing habits -- things like how many bookmarks you've saved, how many tabs you have open across different devices and how many websites you've typed into Chrome's address bar (since last resetting your browser's history). Free cookie* if you guess within five points of any of your values. * A free browser cookie, that is. C'mon -- what did you expect? Provided you use Gmail's archiving system instead of permanently deleting messages, you may be in for a shock: Click the aptly named "Gmail" header in Google's account dashboard, and get ready to see why your days always seem so short. Case in point: I have 145,810 message threads in my Gmail account -- with just over 28,000 sent messages. Let me repeat that: Twenty-eight thousand sent messages. No wonder I never get anything accomplished. File this one under "Cool Yet Creepy": Google Maps' Timeline feature contains a detailed diary of your every move -- down to the minute. No exaggeration: If you carry an Android phone and have opted into location history, the site will show you where you were every moment of every day. And if you really want to weird yourself out, open Timeline from a desktop and click the year tab in the upper-left corner of the screen. Select "All Time," then click the red box in the lower-left corner to see an ordered list of your most visited places. Your smartphone is a fantastic tool for productivity-enhancing tasks like word processing, spreadsheet creation, and... oh, who the hell are we kidding? You're using the thing for mindless web browsing and meaningless game-playing, just like everyone else. 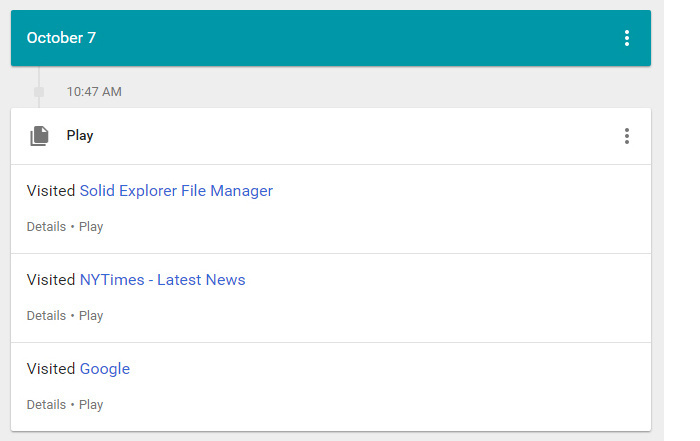 You can see a detailed log of activity on your Android devices at Google's My Activity site. Find out for sure what you're doing on your Android devices -- or what someone else is doing on them, if colleagues or kiddos ever get their hands on your phone -- by opening Google's My Activity site. Select the option to "Filter by date & product," then select "Android" and click the blue search icon. Just don't let your boss see that you spent all of Tuesday's meeting "working" on Words With Friends. These days, Chrome isn't just a desktop browser -- and if you're using the program from a phone or tablet as well as a regular computer, you're bound to have quite the collective history. See where you've been on the web (while signed in to Chrome) by opening Google's My Activity page and checking "Chrome" in the filter list. You can search for specific keywords and even filter further by date -- a useful tool if you ever need to find a site you pulled up somewhere but can't quite remember. 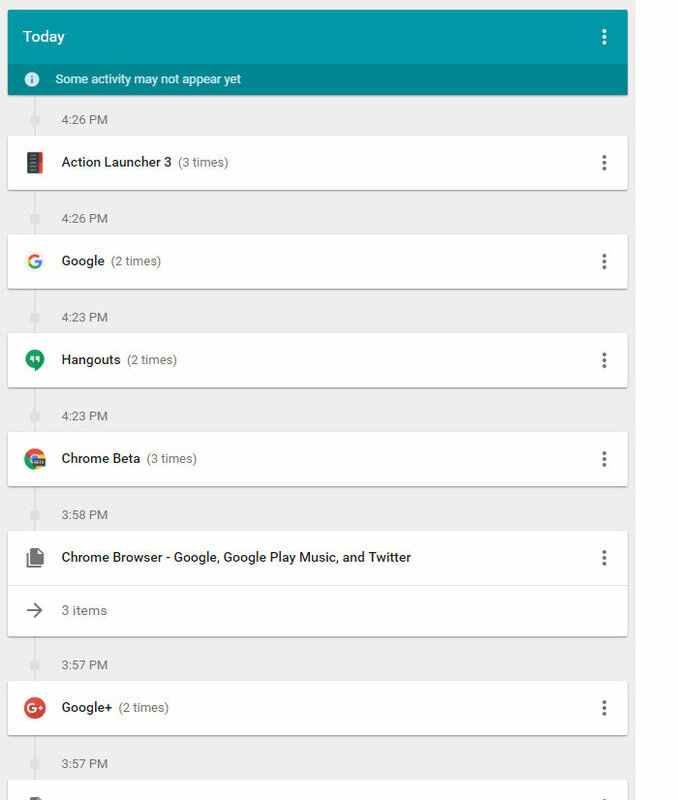 If you're not seeing your Chrome history on the My Activity page, go to the Activity controls and make sure the Web & App Activity toggle is on and the "Include Chrome browsing history and activity from websites and apps that use Google services" box is checked. (Also make sure that you're signed into Chrome on your various devices.) Your Chrome activity will be tracked from this point forward. As for the sites you'd rather not have recorded -- well, amigos, let's just say that Incognito mode is your friend. First and foremost, Google is a search engine -- so how much are you Googling? Get the skinny by scrolling down to the "Search History" header in Google's account dashboard. You can get more detailed info on all the devices, too -- including when each product was last used and a list of all the apps it has backed up to Google's servers -- by clicking the header. And a quick tip: If you want to get old, inactive devices out of your hair, head to the Play Store settings page and uncheck the "Show in menus" option next to any phones or tablets that are no longer relevant. Your Android app stats can be both enlightening and alarming. Trying out new apps is a great way to keep your mobile tech feeling fresh -- to a certain point, anyway. See if you've crossed the line from adventurous to ridiculous by finding the "Play Store" header on Google's account dashboard. If you manage to top my current total of 1,191 apps, seek immediate help. Are you a person who tends to accept event invitations? Or do you say "no" more often than "yes"? If you're a Google Calendar user who frequently interacts with other Google Calendar users, you can find out by clicking the "Calendar" header at Google's account dashboard. That'll give you a breakdown of your accepting-vs.-rejecting activity over the past month, including a handy pie chart to illustrate your temperament in visual form. Hey, at least there's no line graph on the lameness of your excuses. I don't know about you, but I tend to take way too many pictures -- mostly of my 22-month-old daughter (and occasionally of those damn squirrels that always run through my backyard and taunt me with their superior short-term memories). Thankfully, Google Photos makes it simple for me to store all these images and access them anywhere -- and also to see at a glance just how absurdly large my personal photo collection has gotten. To get the lowdown on your own virtual photo box, mosey down to the "Photos" header in Google's account dashboard. And be sure to take a mental snapshot of the result. Everything you've ever searched for in the Play Store, in one centralized place. Have you ever looked at or searched for something in the Play Store -- then tried to find it again later, only to realize your memory was worse than your friendly neighborhood squirrel's? I know I have. We've all been there: You're in the middle of something extremely productive (naturally) when a single YouTube link happens to catch your eye. Watching one video seems harmless enough, right? But then the inevitable happens: One video turns to two. Wait, what's that in the "Related" section -- a clip of a bird whistling the melody to Guns N' Roses' "Patience"? Click. Watch. Repeat. Before you know it, you're 19 videos in, and the afternoon is over. Discover just how much YouTube time-whittlin' you've done in the last month (while logged into your Google account) by visiting Google's account dashboard and clicking the "YouTube" header. And for the love of Goog, if your monthly tally is over 200, think long and hard before clicking that next cat-dancing clip. Want to turn off specific types of data collection or delete existing info from your Google account history? The Google privacy site is the best place to start; there, Google provides detailed information about how each type of data is used along with links to opt out of any specific areas. You can also visit Google's Activity controls page for a simple single-page list of on-off toggles. If you're looking to clean up your history for anything that Google has been tracking, head to the My Activity site. You can delete any individual item right then and there by clicking the three-dot icon in its upper-right corner and choosing Delete, or click the "Delete activity by" link in the left column for an easy way to erase info based on date and/or product. Data collection controls can be also found on an Android device by opening the main system settings and selecting Google (or, if you're on an older device, looking for the standalone Google Settings app) and then tapping "Personal info & privacy."